I’ve been travelling the world for a couple of weeks, but somehow managed to release a New Escapologist along the way. Because of unreliable Internet while travelling, I didn’t post much about the actual contents of Issue 8, which in my opinion is our strongest and most pleasantly readable issue yet. Lots of funny stuff, light things, and practical nuggets. The artwork is also especially good this time and there’s a great interview with Luke Rhinehart to boot. The theme is Staying In and includes homey topics. Editorial: Welcome Home. Robert Wringham on the good life and the merits of staying in. The Vegetarian Escapologist. Mark Wentworth’s funny article on the merits of being a veggie. Drawing the Line. Neil Scott on integrity. Towards Becoming a Good Citizen. Interview with artist Ellie Harrison. Up in Smoke. Matt Caulfield on the pleasures of cigars, and what that means to idle types. Escape Thought. Neil Scott’s theory that it’s possible to think too much. We Are the Makers of Magic. Steven Rainey’s fascinating article about home music production. Going Off Going Out. A witty piece by Dickon Edwards about the effect of aging on one’s social life. Culture with an Open Fly. Brilliant piece about the life and work John Cowper Powys, by Tim Blanchard. Hilarious illustration by Philip Dearest here too. Six Sides of George Cockcroft. 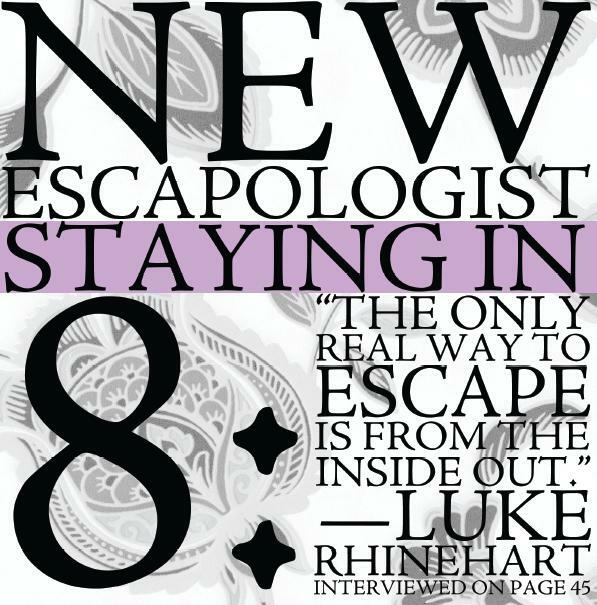 Robert Wringham interviews Luke Rhinehart, author of the famous and devastating novel The Dice Man. The Road Home. Mark Wentworth on what home means to the seasoned world traveller. The Alternative Dwellings. A guide to communes, squats, and tiny homes by Nicolette Stewart. How to Art. A brilliant guide to art collecting for Escapologists, by Samara Leibner. Lovely Tea. Robert Wringham on the perfect cuppa. The Sleepwear of Reason. Reggie C. King defends those people who choose to wear pajamas out of doors or bring work into bed. Great artwork from Lawrence Gullo here too. Your Home is a Blanket Fort. Good living tips from Sipaway Jackson. Outdoors In. Hilarious article by Jon Ransom about how non-outdoorsy types might like to introduce nature into the home. Echo and Poe. Alex Jorgensen investigates the fringes of the Internet. The Joy of Sickness. Robert Wringham on the pleasures of illness and the concept of ‘Dark Epicureanism’. You can buy Issue 8 in print or in PDF at the shop. Issue 8 has also been added to the complete back catalogue package and to the complete PDF package.